Dolpopa Sherab Gyaltsen, was an incredibly influential master. 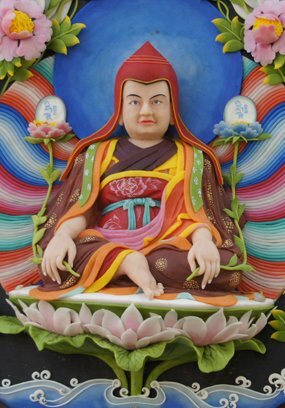 Among his many achievements, he was responsible for developing a unified system of practice which combined the Zhentong Sutric View with the Kalachakra Tantric Practices. Through this system, practitioners would develop their view by meditating on the meaning of Maitreya’s “Five Treatises”. Then they would apply their direct realisations to the practice of Kalachakra. Later, Kunga Drolchok and Taranatha expanded on this system by further clarifying many of Dolpopa’s extraordinary teachings. The Dharma Lord of the Glorious Jonang Tradition. While the earlier Jonang masters were very active academically, due to political obstacles which arose in the 17th century, most Jonang practitioners began to focus increasingly on their spiritual practice. As a result, the Jonang Tradition developed an enormous depth of realisation which allows it to offer the most complete understanding of the Kalachakra system. With presently more than seventy monasteries and retreat centers in Tibet, especially in Kham and Amdo, the Jonang Tradition continues to flourish. In Dzamthang Monastery alone, more than 5000 monks are currently studying Zhentong Madhyamaka as well as the five major subjects of Buddhist philosophy, following texts by Dolpopa and other revered Jonang masters. A three-year Kalachakra retreat has become a traditional part of training in the monasteries of the Jonang tradition and there are many yogis today engaged in lifetime retreat, practising the Six Vajra Yogas. Due to the kindness of masters such as Khentrul Rinpoché, the modern world is slowly gaining access to the ancient wisdom of this profound tradition.